Local 5106 VP Sue Clements participated in a “Tuesdays with Toomey” (Pat Toomey is the Republican Senator from Pennsylvania) rally in Philadelphia to highlight how the Affordable Care Act (ACA) has expanded and improved medical services for children—the same services that are under attack by Congress. Parents spoke up about the crucial difference that the ACA and Medicaid expansion has made for their children and families. One young mother with three children, and a mother of a boy with multiple severe food allergies, both shared how they depended on the ACA for medical coverage for their families. Another mother of a three-year-old girl with Down’s syndrome explained that she could not have afforded all of the services and equipment without Medicaid, even while she and her husband are both professionals with health insurance coverage. Repealing the ACA puts not only the asthmatic child at risk, but also the parents who may have to miss work, or have less time to care for other children. These situations could be easily prevented with the right care provided by the ACA and expansion of Medicaid. Other speakers talked about relying another Medicaid program, the Children’s Health Insurance Program (CHIP), to provide their growing children with essential care. 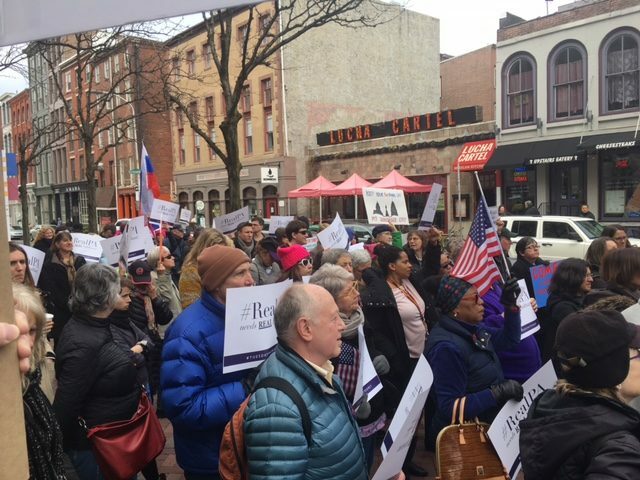 The rally in Philadelphia and similar efforts across the United States have put tremendous pressure on Senators and Congresspeople to vote against plans to repeal and replace the ACA. Activists achieved a victory last week when House Republicans had to admit defeat and pull their American Health Care Act bill after failing to garner enough support. We know our advocacy is making a difference, and it is time to stay strong and continue fighting for the right to healthcare and education in Pennsylvania, New Jersey, and across the country.